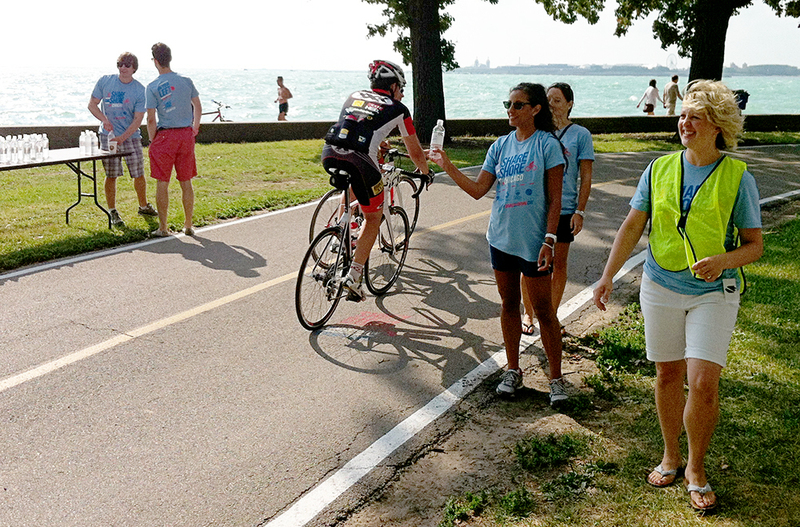 Share The Shore members offer bottled water to Lakefront Trail users. Stenciled message on the trail. Friday morning commuters on the north half of the Lakefront Trail probably noticed lots of people in light-blue t-shirts. Some were handing out bottled water while others picked up trash. They were part of an educational campaign called Share The Shore bringing members of the Active Transportation Alliance, Chicago Area Runners Association and Friends of the Parks together with publicity firm GolinHarris. Their goal- less collisions along the lakefront. Katie Palasik of GolinHarris said the main goal is promoting safety and shared etiquette. That&apos;s why the light-blue shirts say "On Your Left" on the back left shoulder. 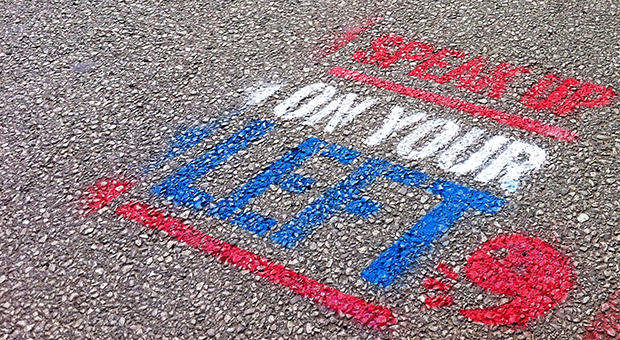 The phrase was also stenciled on the path. Citing collision data from the Active Transportation Alliance, the coalition hoped getting cyclists, runners and tourists on the same page could result in less crashes. Lee Crandell of Active Transportation Alliance said that in addition to signaling "On your left" when passing, cyclists should also be sure to slow down in congested zones. That, combined with walkers, runners and cyclists traveling in single file as often as possible would cut down on collisions. Active Transportation Alliance is conducting a survey of Lakefront Trail users here. The "Share The Shore" pledge is here. Which group needs to step up its Lakefront Trail etiquette ?